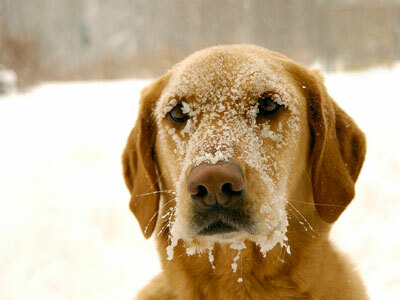 The cold months present a problem for outdoor dogs. During the winter, outdoor pets are particularly susceptible to dehydration. Since small bowls of water freeze quickly, twice-a-day watering is not sufficient. We recommend a large, deep, plastic bowl, since a large deep bowl of water freezes more slowly than a small, shallow one. A plastic bowl is more efficient than a metal one. Metal has a tendency to loose heat more quickly. In subzero temperatures or situations where the water cannot be changed several times a day, a livestock water bucket heater is useful. A outdoor pet's food ration should be increased during the cold weather. Generating internal body heat requires energy. Animals get this energy from the food. A good quality, easily digestible pet food is extremely important for your pet during the weather season. Before increasing the quantity of food, make sure that your pet is not overweight.